Imagine that you have been running ad campaigns for a client for a year, and it’s been going well. You can and should suggest increasing the ad budget to your client, but you must make sure that the client will get benefit from the extra cost. If the agency’s goal is only increasing its own revenues, it will be extremely difficult to “sell” this idea to the client. In this post we’ll cover a 4 point strategy to help convince your client to increase their advertising budget. These tips will help the client see the opportunity rather than only the potential expense. 1. Show Your Clients That a Campaign is Getting Results but there is Still an Opportunity for Scaling Up. 1) Positive return on Investment (ROI). 2) High-quality traffic (creating sales leads). 3) On target Cost Per Action (CPA). For each client, the goals may differ. For example, if the customer is ok with the current cost per conversion, we can increase the amount of traffic and hence the conversions by increasing the budget. 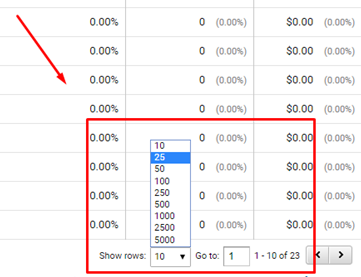 Adwords has a built in functionality to show you where these opportunities exist right from the Adwords interface. 1. Open the AdWords account. 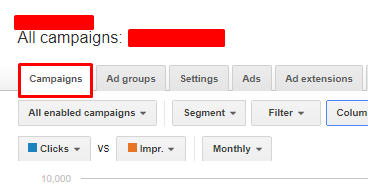 Choose the Campaigns tab. 2. 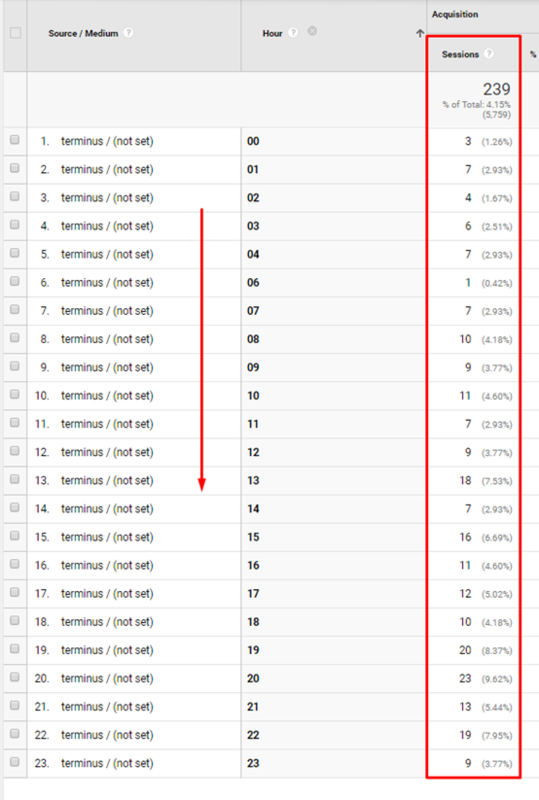 Sort campaigns by the “Status” column. We are interested in the “Limited by budget” status. If we see that the cost per conversion is within the required range, and at the same time there is a “Limited by budget” status, this means that we can painlessly increase the budget and get more conversions. 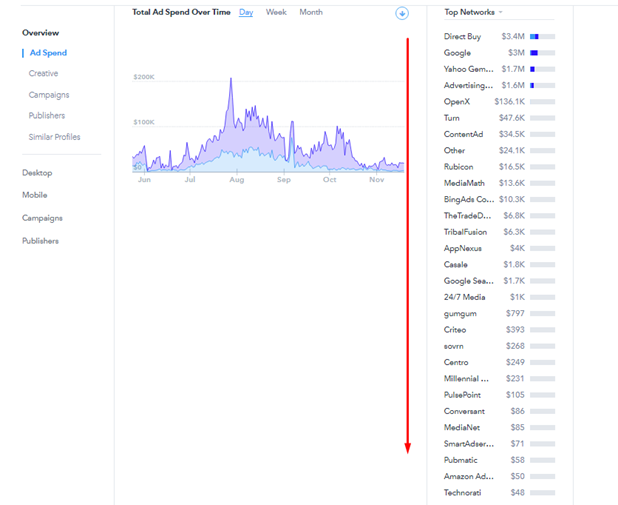 Analyze Traffic by Hour of Day (Suitable for Any Ad Network) to find missed opportunities later in the day. 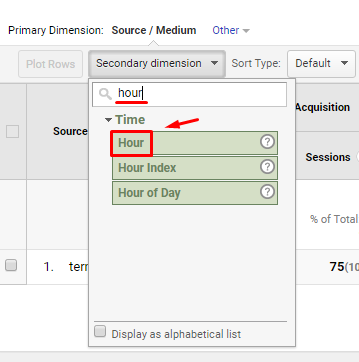 You can look at traffic and conversion data by hour directly in your Adwords account by using pre-defined reports (formerly called Dimensions). 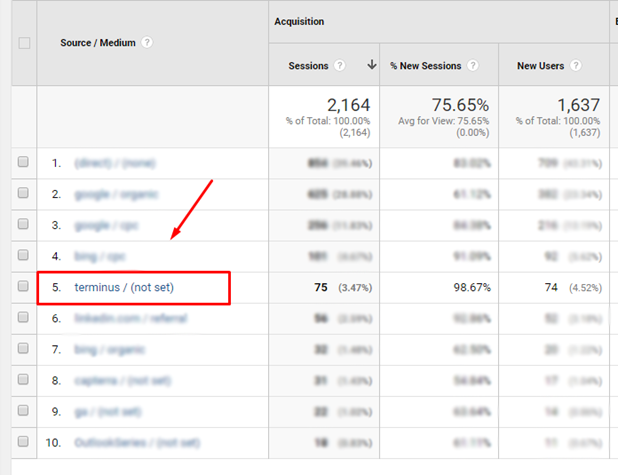 However, because it’s a more universal approach, we’ll show you another option using Google Analytics instead. 1. 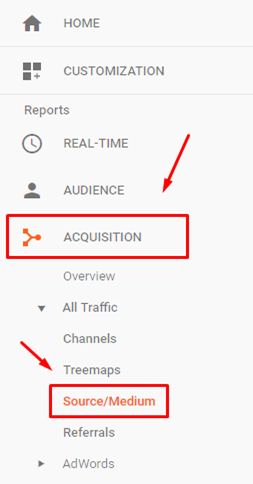 Open the Google Analytics account. On the menu bar, choose Acquisition > Source/Medium. 2. Then choose the right source, for example, the Ad Network you want to analyze. 3. Press the Secondary dimension button and enter “hour”. 4. Select 25 lines in order to display all 24 hours on the screen. 5. Now we can see the number of users at each hour throughout the day. If, for some reason, we see that there is no traffic after a certain hour, this is a good indication that the daily budget is running out by this time. Obviously you’ll have to keep in mind normal traffic trends based on geography, business type, etc. If we know for example, that for a particular ad campaign the main traffic occurs during business hours, but by 2 am the clicks from Ad Network have ceased. Then this is definitely a sign that the daily budget has ended early. If budgets were higher for the campaign, this would not have been an issue. This is exactly the type of opportunity you might choose to point out while talking with your client about the possibility of raising the budget. Just to keep the math simple as an example, let’s say that an e-commerce client has a budget of $10,000 per month evenly distributed across 10 networks. This means that there is only $1,000 for each network. The client has 11 advertised products for sale and the budget is evenly distributed among them. The average cost per click is $1. This means that the client receives 1,000 clicks per month from each ad network. 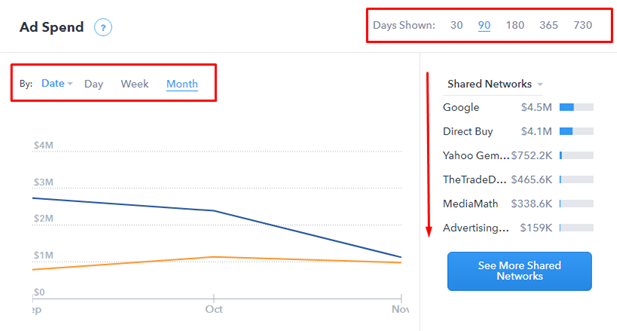 At the same time, for each of the products, there are only 91 clicks per month (1000/11), or about 3 per day. Just 91 clicks per month for each product isn’t nearly enough traffic to give you statistically significant results for a typical 1-2% conversion rate targeted action. If a network is given such a small budget, it will take too much time to get a statistically significant amount of traffic. In this situation, you can suggest increasing the budget for some (or preferably all) networks to receive a reasonable amount of traffic for each of the products. Reducing of the number of networks and/or products is also an option, but not the best one if they want to identify optimal acquisition channels quickly and maximize revenue. Many agencies have found that the argument that the client’s competitors spend more money works well. This can be a powerful incentive, but you need data to back up such a claim. 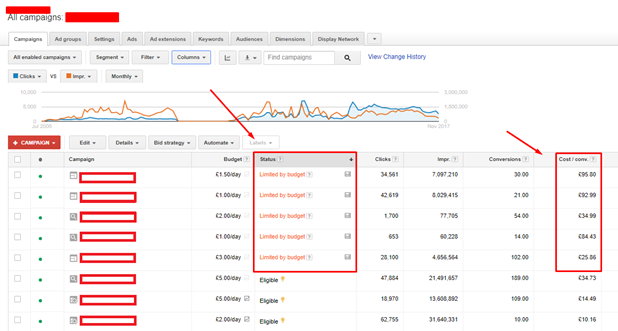 There are a lot of services that help assess the budgets of competitors for search campaigns, but not for display or native campaigns. 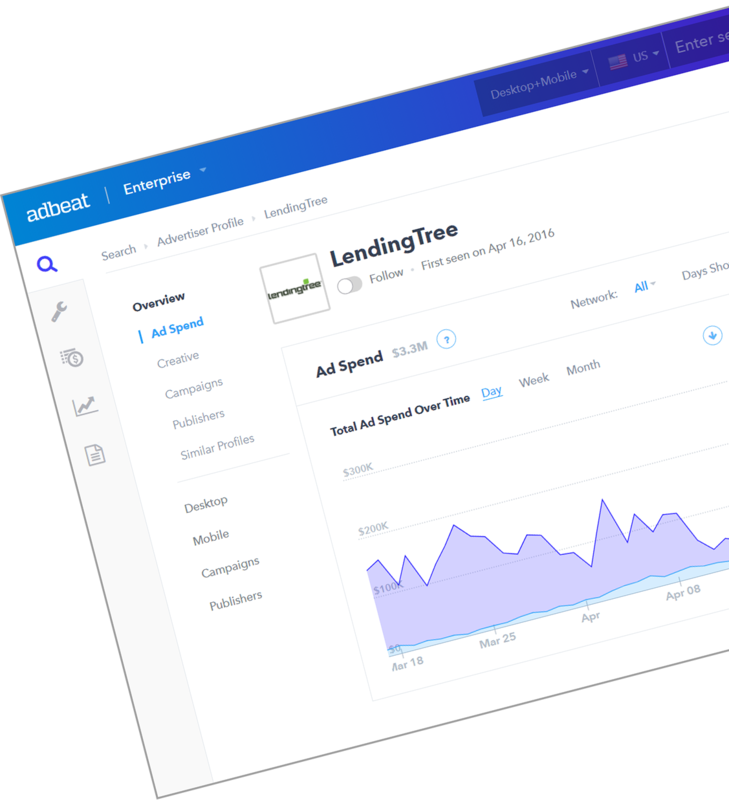 To get access to competitors’ budgets on display and native campaigns, we suggest using Adbeat. 1. Open Adbeat, and on the menu bar, choose Tools. 2. 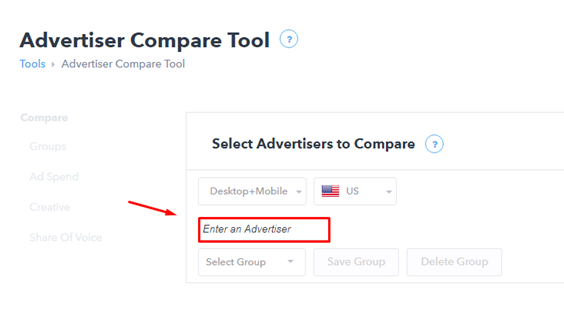 Choose Advertiser Compare Tool. 3. Enter your competitors’ URLs. 4. In this example we will choose two main competitors, but you can add up to five at a time. 5. Sort by the period or by the date you want. 6. Keep in mind that if the month hasn’t finished yet, its budget may be lower. 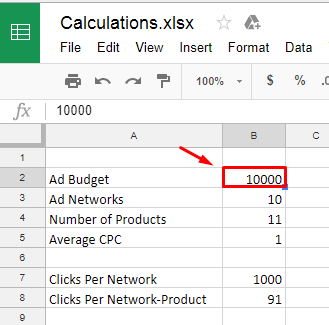 Now you can see the display ad budgets of your customer’s competitors. 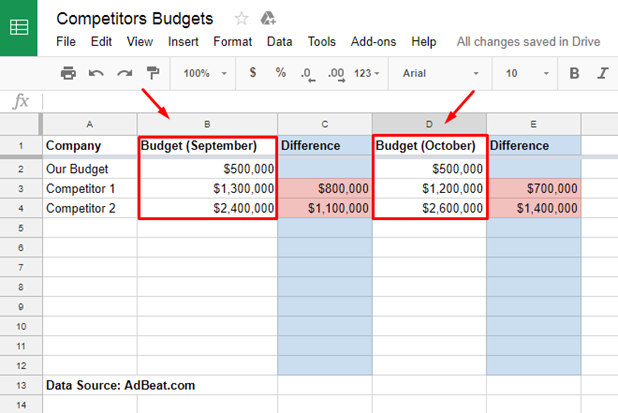 You can make a screenshot or create an Excel table based on data from Adbeat, or just copy and use our ready Adbeat Excel table template. Here we see that the second row is our budget, and the second and the third lines include competitors’ budgets. In column B we see the budget for September, and in column D for October. Columns C and E contain the difference between our budget and that of competitors. If competitors have more budget, then the difference will be highlighted in red. And ifwe have a larger budget, the difference will be highlighted in green. 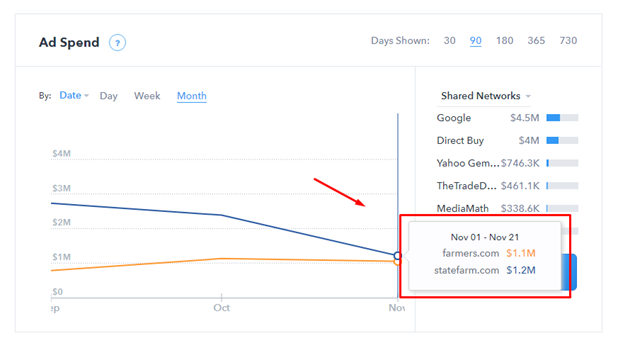 A simple visual like this table backed by reliable data from a trusted source is a great tool. It’s easy for a client to see the missed opportunity, and because of that they can make a strategic decision to increase spend more easily. 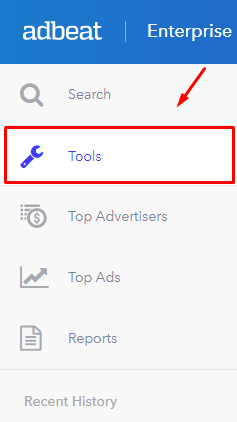 AdBeat.com helps with defining traffic sources for ad campaigns as well. 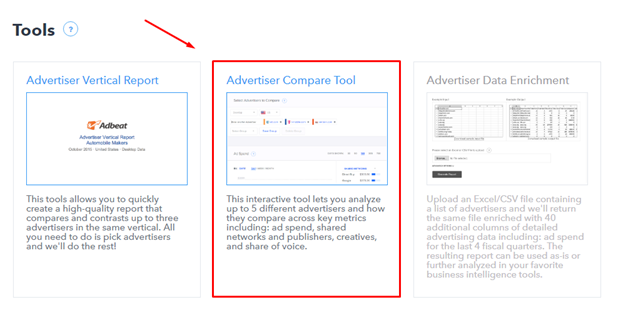 You may get information like sources of traffic, ad spend, as well as look at banner examples using Adbeat. 1. 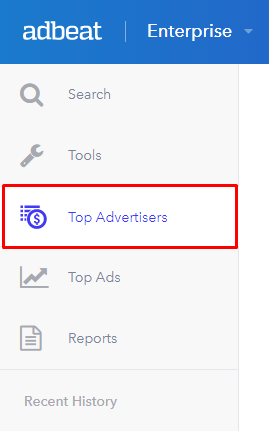 Go to the Top Advertisers section on the menu bar in Adbeat. 2. Enter the competitor’s website URL. 3. Press the See All Networks button. 4. See the whole list of ad networks used by your competitor. 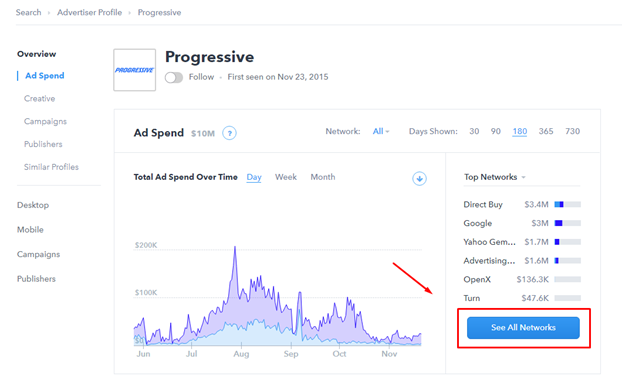 In this section, we can see all ad networks, or select just some that are interesting to us. Look for differences in your own client’s budget allocation. There may be missed opportunities here, and you can suggest trying out some new networks. We have some ideas on how Company X can get better results/profit/conversions. Being persuasive about the need for a client to bring more money to the table is not an easy task. In this article, we’ve given some practical tips on how to show a client that increasing the budget for an ad campaign is necessary to get the best results. Highlighting the fact that competitors are spending more than your client on their campaigns can be a powerful motivator. If that doesn’t trigger your client’s competitive drive, we’d be surprised! Show opportunities to scale up on new traffic channels that your competitors may already be using effectively. Providing a data backed expectation that the success of the campaign will improve should the budget be increased will help you be more persuasive. 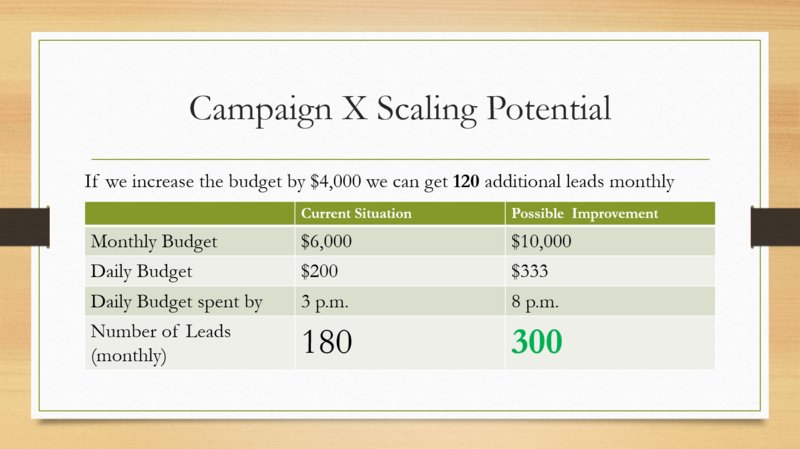 Prove that effective measurement of the success of the campaign requires a larger budget. After getting all your points together, make a simple easy-to-understand presentation and schedule a meeting with the client. 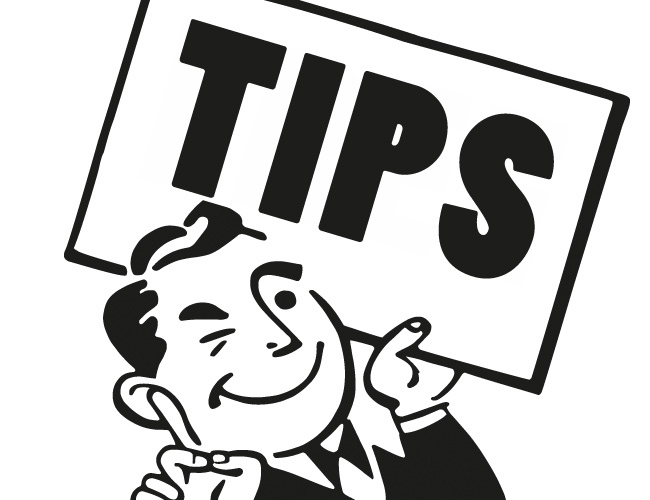 Let us know if you followed our tips and managed to persuade your client to increase budget or try a new approach. Let us know if you have any tips of your own, how a conversation around budget has gone in the past for you, or any other advice you may have on this topic.